We decided to get out and about on Labor Day and opted for a delightful morning hike to Cecret Lake at Alta Ski resort. This hike through the Albion basin is renowned for its wild flowers in July and August. We missed the flowers, but still had an enjoyable hike. I was happy because it was only a one mile round trip hike with only one steep section. I was also happy because my devastated hiking knees and legs from last Friday's hike were almost back to normal. Thanks to our backyard neighbors the Parker family for giving us the idea. They did a family hike every Friday during the summer with their four kids ages 1-10.We decided that if they could do it we could do it. I have skied at Alta many times and have never ever focused on the fact that in clear view of two chairlifts there was a frozen lake hidden under an average 560 inches of snow fall each season. Cecret Lake is right above run 47--Cabin Hill. It's a 0.4 mile hike up to the lake which is nestled under the peak of Devil's Castle in the center of the photo. Sugarloaf Lift in the distance. Joel rockin' it in his Alta shirt. This kid always thinks the water his parents are carrying is colder and better than his water. Perhaps it is the BYU Jerusalem Center insulated pouch that Marie uses or her Namibia safari water bottle that makes it better. Marie led the charge to circumnavigate the lake. The top of Supreme Lift. Another moose. Two in four days. It must be my spirit animal. Once home Will enjoyed some Fortnite time and then soccer practice, Joel studied for Calculus and AP Lit (by reading the Life of Pi) followed by spike ball with friends, and Marie and I kept busy with household duties including the making (lots of chopping) of 16 pints of salsa with tomatoes and peppers from our garden. Making the day even better was that it is a Monday which means we get to hear from Sarah. Her weekly letter and some photos arrived in our e-mail boxes around 5:30. Always a highlight of the day and week. 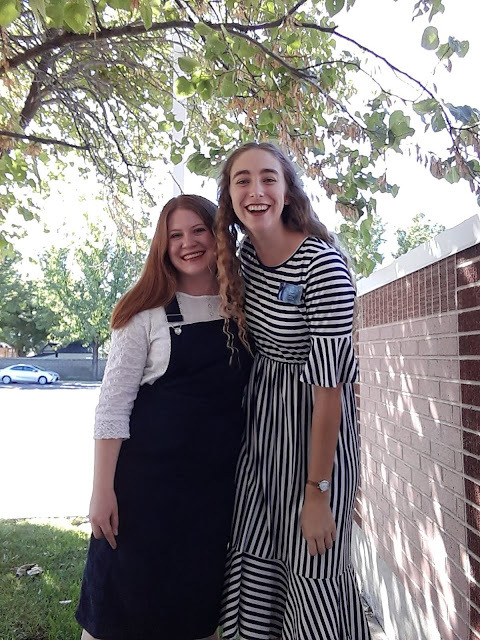 She is loving serving in Kaysville Utah and has less than 6 months to go. Sarah and her companion Hermana Lamb. Over all, a very good Labor Day. Sarah is currently serving in the Francis Park Ward (Spanish) in Kaysville. Last month I dropped off a big birthday box of garden produce and other presents for her at the Mission Office in Fruit Heights. Here mission has been a good geography opportunity. In Kaysville many of the Spanish speakers are from Venezuela, while Clearfield was much more Mexican. She's met people from all over Latin America.